INGREDIENTS: Crushed Tomatoes, Heavy Cream, Vodka Alcohol, Extra Virgin Olive Oil, Garlic, Sea Salt, Black Pepper. 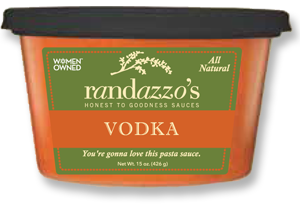 As with all of Randazzo’s Honest to Goodness Sauces, this vodka sauce has a smooth, satisfying taste and a rich, yet delicate texture. Jersey Fresh tomatoes and cream balance themselves with a touch of vodka. Served alone on any pasta or mixed with a variety of meats or vegetables, Randazzo’s Honest to Goodness Vodka Pasta Sauce is a crowd pleaser, good enough for company, easy enough for a Tuesday. Add a little color, and vitamins, to your vodka sauce by topping with cooked peas or steamed/sautéed broccoli florets. Give new life to your chicken parmigiana by substituting vodka sauce for marinara. Top with thin slices of provolone and this might become a new family favorite. Get the party started by serving your guests vodka pizza-tinis. Simply spread vodka sauce over naan bread or pita bread, top with shaved parmesan cheese and bake until the cheese is slightly melted. Cut into triangles and decorate your favorite martini glasses with 2 or 3 of these clever little hors d’vores.